Prospecting For Trout by Tom Rosenbauer is one of the best small stream fishing books I have come across. I know that because I work for Orvis some might think that this is a covert plug for company products but I assure you that is not the case. You may find this to be strange but I have been 100% Tenkara fishing for the past year. I don't even currently own an Orvis rod and I do get a generous employee discount. Mr. Rosenbauer believes that the understanding of how and why trout behave the way they do is far more important than becoming a streamside entomologist. He goes into great detail about stream composition and how that affects how trout behave the way they do. He has written a simple to understand book that will greatly benefit any fly fishing angler. In the end, the author is really a Tenkara fisherman, he just doesn't know it yet. His ideas are a perfect complement to Tenkara fishing. I have been applying his ideas for several months now and I have seen a noticeable difference in my fishing success. I now look at every stream with a new set of eyes and I am finally starting to understand the hows and whys of these complex ecosystems and I am becoming a better fisherman because of that new understanding. If you have ever wondered why the simple patterns of traditional Tenkara flies seem to be so effective, by the time you have finished the book you will understand why and how the one fly philosophy really does work. I have just started offering books on the TenkaraBum site. Prospecting for Trout sounds like it would be a good resource for tenkara anglers. I have ordered some copies and they will be available here on the site within a week or two. That book looks like something I could use. I have been tenkara fishing for about a year now, and while I catch more trout than I did before, I still have no idea what to do when I get to a trout stream. I have some general ideas, but I am sure I pass by a lot of fish because I don't know what to look for. As a side note I think it would be great if someday a company like Orvis offered a tenkara rod. I bet they could make a nice one. Tenkara USA rods are really high quality. The only thing Orvis does better on their rods is the quality of the cork on the grips. I know, I fish with Tenkara rods and work for Orvis. What an awesome idea for a book that is written for the Tenkara fisherman/woman inadvertently. I will be running by my local Orvis store to see if they have it in stock. Thanks for the heads up on this. If they don't have it, I should receive my shipment any day now. I thought it might even be here yesterday but no such luck. This is a MUST by book for everybody, its full of very useful information. After reading this book the trouts don't stand a chance of eluding you, they can run, they can hide, but you will find them! I was very fortunate last month that the Ottawa Fly Fishing Society had Tom do an all day seminar on prospecting for trout. I found out that he is very interested in studying Tenkara fishing and Orvis is considering making Tenkara rods. If you every get a chance to see him you will not regret it. Just to let everyone know, I now have the book in stock and ready to ship. It has already started to sell and I have four copies left. 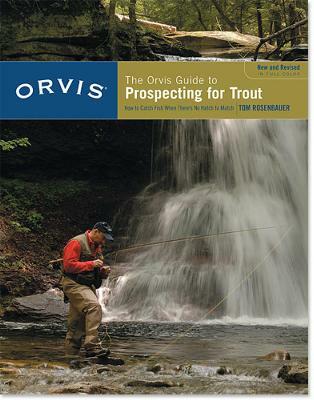 Click the "Prospecting for Trout" button or the "Books and DVDs" buttons to the left.